There’s one aspect of any pest control product that is beyond important above everything else – the level of its performance against the pest that it’s labeled to control. When bed bugs were re-introduced to the world over a decade ago, several pesticides could offer strong control to PMPs. 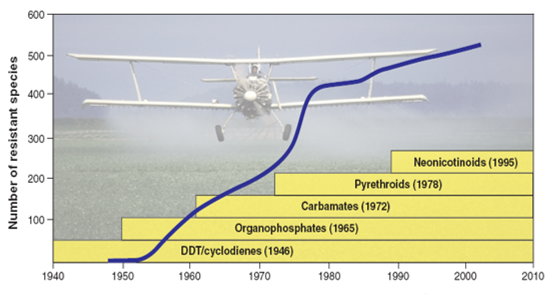 Almost 70 years ago, DDT (dichloro-diphenyl-trichloroethane) was developed as one of the first modern synthetic pesticides, even being touted as the “wonder chemical” to solve all pest problems big and small. As that was phased out not only for resistance but for the other issues it caused in the environment, it was replaced by numerous other types of chemicals. Most recently, pyrethroids and neonicotinoids have been used to control bed bugs, but the resistance issues have been well documented. The journal PLOS One reported in April 2016 that bed bugs have been developing a thicker skin that provides a greater deal of resistance to traditional pesticides. Resistance forces pest control professionals to explore options that do not relate specifically to penetrating the exo-skeleton of the bed bug with a pesticide. Bed bugs also now have higher levels of enzymes that can detoxify the chemicals and their nervous system has adapted to allow its cells to withstand toxic effects. Because of all of this – synthetic pesticides are no longer the automatic solution that they were years ago. PMPs are now using a wider array of solutions in their “toolbox” to try to reduce the resistance issue. A mixed use of heat treatments, green / natural solutions, pesticides and other approaches are now being used by many professionals. For PMPs to maintain a strong level of performance against bed bugs, a solid IPM program must be maintained to rotate classes and integrate a good amount of natural solutions, which do not face resistance, to balance out the pesticide use. For more information, visit https://ecoraiderpmp.com/ or call 1-800-338-0212. Also, follow us on Twitter and LinkedIn.